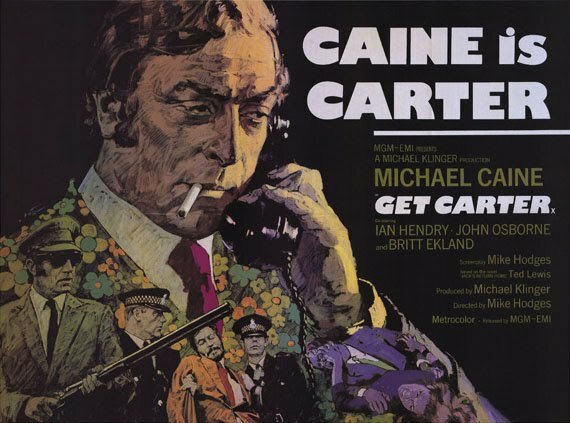 In honor of director Mike Hodges‘ gem of a crime film, one that debuted 40 years ago today — and for which Ed Copeland offers an appreciation of in a blog post — a look at Get Carter‘s superb movie titles is fitting, I thought. A marvelous mix of story elements, superb photography, and at the very least an absolutely jazzy theme score that powers us through the tunneled landscape flying passed our eyes. There are a number of the things I love about this film sequence. The sounds of the commuter train at it reaches the first tunnel in the journey north for the title character, Jack Carter (Michael Caine in an eye-opening performance). The simple white titles appearing upon the stark black we’ve been thrown into signaling the start of the sequence. “Get Carter” coming into view as we near the exit of the passage, and as we become aware of what it portends. It’s Jack’s next scene after the main title that offered a wonderful literary reference as we look briefly on the London mob’s angelic faced enforcer reading Raymond Chandler’s Farewell My Lovely. The calm demeanor of an experienced traveler masking his uniquely brutish charms. Director of Photography Wolfgang Suschitzky’s lens sweeping across the train car’s compartment as Roy Budd’s stellar rhythmic jazz track commences in naturalistic fashion. Surely, one of the great and neglected movie theme instrumentals around that accompanies the sequence made it so very memorable. And oh so cool. One could say it bookended well with Lalo Schifrin’s main title score from years prior for Bullitt, I think. In fact, joined with the stark visuals depicted in this impressive title sequence on the train, even the closing scene along the desolate dark shores of the city Jack’s headed to, made the whole train trip worth it. Intermixing headlong shots of the locomotive’s prime view going below numerous underpasses, and many a tunnel, on its way to gritty Newcastle; splashing the credit titles along the shadows and darkness. Always shifting back to our anti-hero, a marvelous bit of editing by John Trumper. Even after all these years, the surprise foreshadowing of the ‘J’ character as just another passenger on the same train car remains one of the cleverest bits by this underrated director in the film. One I never tire of watching even after all these decades later. How About This For March Madness? Good call! My favorite part is how he cleans the spoon before eating the soup and also how he looks around while eating the soup. Great piece of acting! Yeah, this was one of the great early Michael Caine performances… and from a fantastic decade of film. Thanks, Joel.